Sarah Lahbati is in control of what defines her, whether off- or online. She's made one thing clear, though: She's more than her social media following. Scrolling through Sarah Lahbati’s masterfully curated social media feed is giving us strong mermaid energy. There are rows of vibrant images featuring local and international landscapes, OOTDs that deserve to be on an editorial spread, picture-perfect family photos, and wildlife shots. Sarah has also started blogging where she does a deep dive into what goes on behind those travel shots and her everyday life. By creating her own online content, Sarah felt that she was able to carve out her own identity and personally reach out to her fans. But what does having a prominent online presence mean for her offline persona? Sarah has been doing the balancing act of keeping her privacy while sharing her vulnerabilities, passions, and pursuits to legions of followers. Not an easy feat. We find out how she handles being more than the sum of her parts as we unpack the three important aspects that you need to know about this actress-slash-blogger. The couple even left for Thailand a few days after the shoot. Sarah exclaimed with accompanying laughter, “Mommy needs her me time! Whenever I feel stressed out, I take a break and not think about anything else. I remind myself to be grateful for what I have now to avoid complaining. Sarah enjoys lounging about in stylish swimwear and having a fashion moment for the ’gram. But when it’s time to start exploring the deep blue sea, she’ll quickly suit up in more athletic gear. With her derring-do attitude, Sarah wouldn’t be out of place in a Lara Croft type of situation. However, she’s not a stranger to experiencing the jitters when attempting a new sport like free diving in Fiji. “It’s not easy at all! You have to hold your breath and go underwater. You’re not supposed to eat a lot beforehand [which proved difficult for me as an avid snacker.] I asked the Fijians ten thousand questions such as ‘Is this safe?’ ‘Has there been any incident here?’ and so on." Everyone in her family shares that adventurous streak. Richard is into sports, traveling, and of course, the sea, as they’re both licensed scuba divers. Zion and Kai are natural-born swimmers (well, more on splashing about for the younger one since he just turned a year old) who are well acquainted with the aquatic life as they constantly tag along with their parents to the beach. 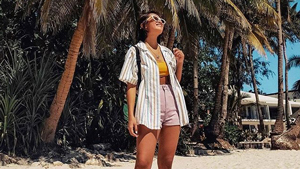 Their fondness for summer is quite apparent in the amazing vacation shots featuring her fashionable moments, family photos, and the sea life. “Nothing beats the Philippines. We have the best islands! There are so many things to do, people to meet, and locations to check out." When asked about the long-circulating rumors regarding the Darna reboot casting, she shares she would be open to playing Valentina or any other badass character in the movie. On the non-show biz front, she’s also planning on attending business school or pursuing fashion in the long run. “For us actors and actresses that have a following, we have to be responsible for sharing something that’s inspirational and encouraging. You have to think about the consequences of every post, especially with kids following your feed."